It’s one of those annoying laws of nature that the times you want to do a demonstration of static electricity with a Van der Graaf generator are the times when the atmosphere is least suited to it. Damp conditions equals a damp demonstration. But yesterday was really good. 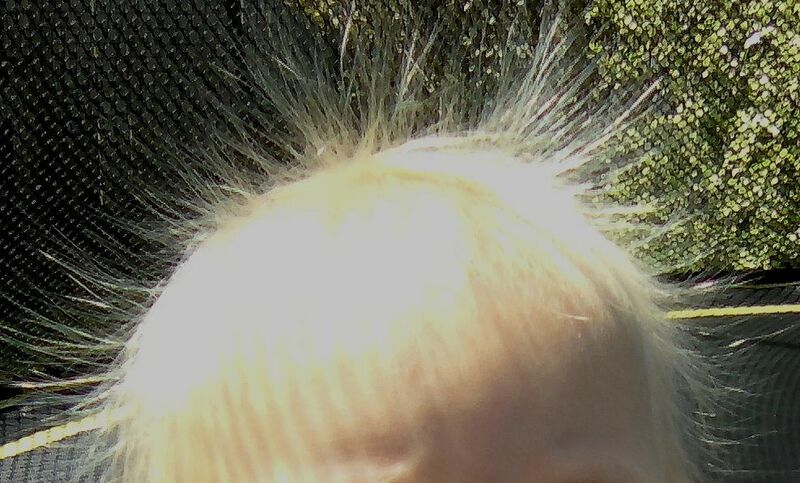 No Van der Graaf generator needed – just a ten-month-old on a trampoline. A bit of crawling around and it really was a bad hair day for the bubba. Apologies for the cropped, slightly out-of-focus cellphone photo. Keeping the subject still was a bit problematic. The very fine hair will be playing a part in this photo – not much charge is needed to separate out those strands. Needless to say, we both were ‘shocked’ when I lifted him off the trampoline.